The simple description is that it’s “lettuce with bacon and eggs”. And anything with bacon has got to be good, right? 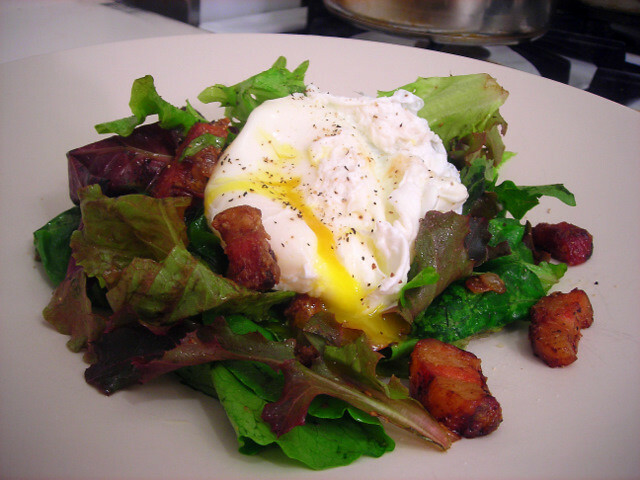 This is the basic version of salade Lyonnaise, as demonstrated by this recipe by Mark Bittman of the New York Times. I’ll post about a slightly gussied up version later in the week. 20 Jun	This entry was published on June 20, 2010 at 1:42 am. It’s filed under food, French food, general and tagged bacon, dinner, eggs, quick and easy, salad, seasonal and local. Bookmark the permalink. Follow any comments here with the RSS feed for this post.